The other day I was eating a breakfast I have pretty regularly: plain Greek yogurt, drizzle of honey, fresh berries and bananas and some granola on top. This breakfast is a good balance of protein, good carbs and healthy fats to keep me feeling full for a long time in the morning. You have probably bought this particular granola yourself if you are a regular Costco shopper like so many of us are. You know the box…. There are roughly 151 calories in an ounce (28 grams) of shell-free pumpkin seeds, mainly from fat and protein. A large observational study found that eating them was associated with a reduced risk of breast cancer in postmenopausal women. Others studies suggest that the lignans in pumpkin seeds may play a key role in the prevention and treatment of breast cancer. 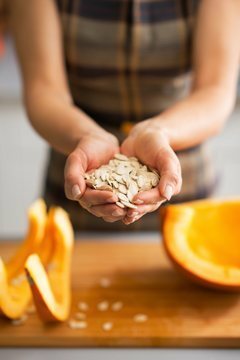 Breast and prostate cancers are some of the most common that we are more at risk for developing at some point in our lives so I really like thinking that I can just add a few pumpkin seeds to my diet every day as an easy way to try and prevent breast cancer for myself. Several studies in humans found that eating these seeds reduced symptoms that are associated with BPH. There is also research to suggest that taking pumpkin seeds or their products as supplements can help treat symptoms of an overactive bladder. Taking a supplement of 10 grams of pumpkin seed extract daily can improve urinary function in men and women. Pumpkin seeds are a great source of dietary fiber. Whole seeds provide 5.2 grams of fiber in a single 1-oz (28-gram) serving. However, pumpkin kernels with the shell removed contain 1.7 grams of fiber per ounce. These are the green pumpkin seeds available in most supermarkets. A diet high in fiber can promote good digestive health. In addition, they have been associated with a reduced risk of heart disease, type 2 diabetes and obesity. Pumpkin seeds are a good source of tryptophan, zinc and magnesium, all of which help promote good sleep. I think it’s safe to say that pumpkin seeds are amazing for your health. There are so many benefits for our bodies and one of the coolest things about them are so are so easy to incorporate into your diet. You can throw them onto salads, into smoothies or cereals, or even bake them into sweet or savory breads or cakes. 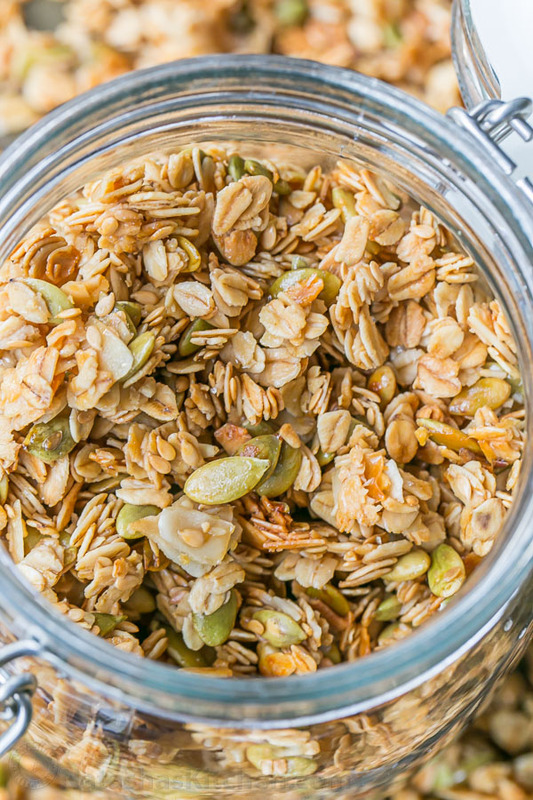 What are your favorite ways to eat pumpkin seeds? 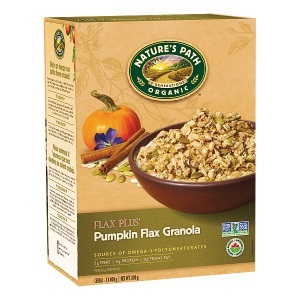 In a large mixing bowl, combined 3 cups rolled oats, ½ cup coconut flakes, 1 cup pumpkin seeds and ¼ cup flax seeds. In a second bowl, stir together ¼ cup honey, ¼ cup of maple syrup, ¼ cup coconut oil and ½ tsp salt. They will combine easier if you heat them in the microwave 15-30 seconds. Drizzle the liquid mixture over the dry ingredients and gently toss/stir until evenly coated. Spread out onto a really large ¾ baking sheet lined with parchment paper and bake at 325 for 18-20 minutes, stirring once halfway through baking for even toasting. Remove from the oven and let cool completely then crumble with your hands and store in an airtight container at room temperature. Measure your coconut oil first then measure honey in the same cup. The oil coats the cup so the honey slides out easily.